Novartis, the Swiss drug maker, has agreed to buy the US cancer-treatment provider Endocyte, for $US2.1 billion. Under the agreement, Novartis will pay $US24 a share in cash for all outstanding shares of Endocyte common stock. Endocyte stock exploded 50% to $US23.48 following the news. Watch Endocyte and Novartis trade in real time. Endocyte, a US cancer-treatment provider, exploded 50% early Thursday after announcing it has reached a deal to be acquired by the Swiss drug maker Novartis. Under the agreement, Novartis will acquire all outstanding shares of Endocyte common stock for $US24 apiece -totaling $US2.1 billion – in cash. The offer represents a premium of 54% to Endocyte’s closing price of $US15.56 on Wednesday. Endocyte shares were trading at $US23.48 on Thursday morning. Novartis said that, after completing the deal, it will harness its research and expertise to investigate the development of Endocyte’s 177Lu-PSMA-617, a potential first-in-class investigational radioligand therapy (RLT) for the treatment of metastatic castration-resistant prostate cancer. “We are thrilled that Novartis recognises the potential for 177Lu-PSMA-617 to change the treatment landscape for men with metastatic castration-resistant prostate cancer (mCRPC), as well as the broader role that RLTs may potentially play in the treatment of cancer,” Endocyte CEO Mike Sherman said in the press release. Novartis shares jumped 1.31% on the news and were little changed this year through Wednesday. 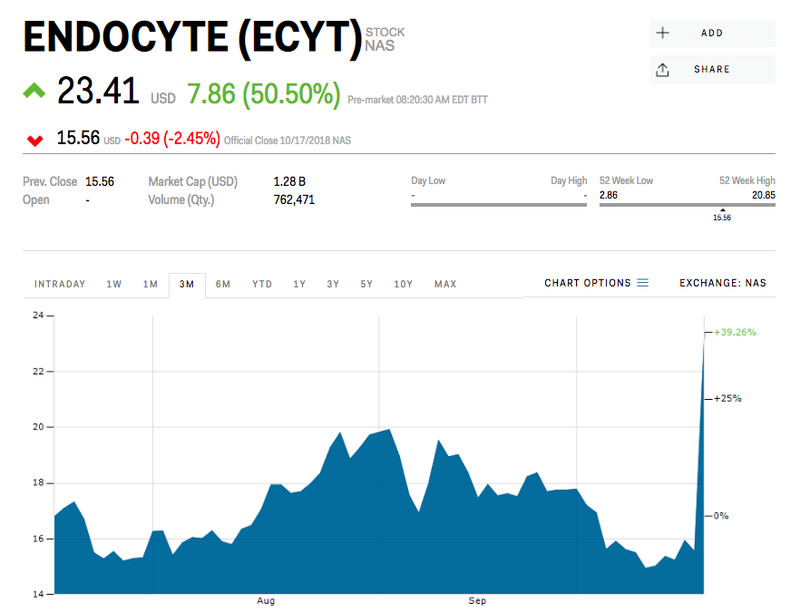 Endocyte shares were up 400% this year.